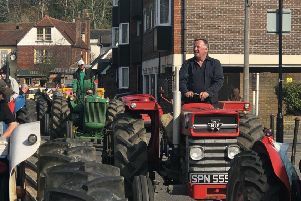 COUNTY NEWS: Could Channel 4 come to Sussex? A council in Sussex has made a bid to Channel 4 to become one of its three 'creative hubs'. The company plans to open three new creative hubs in regions outside of London, including a national headquarters. And last week, Brighton and Hove City Council – along with the local television sector, Brighton and Sussex universities and Greater Brighton Metropolitan College – submitted a bid to become home to one of Channel 4’s new creative hubs, in which it outlined the city’s 'distinctive offering as a major digital and creative centre'. It argued that the city’s reputation for digital innovation and the arts, and its transport links would make it an ideal destination for Channel 4. Cllr Alan Robins, chair of the tourism, development and culture committee, said: “Channel 4’s move out of London presents an excellent opportunity for our city. “We are home to hundreds of artists and creative producers and we host more than sixty festivals a year, including two of the most significant arts festivals in the country. “We have a culture that values innovation, collaboration, social responsibility and pushing boundaries – all values we share with Channel 4. “Brighton & Hove has a long-held reputation for doing things differently. We’re known for being a place where people are open to new and different ideas, where creativity and innovation are encouraged to flourish. Lisa Fairbank, managing director of Factory Films, a Brighton-based TV production company, said: “Brighton and Hove is home to thousands of talented creatives from the film, TV and online. “Over the last two decades, more and more television and film production companies - not to mention online stars - have been creating shows that are not just seen on TV in this country, but all over the world, from their bases in Brighton. Channel 4 launched its '4 All the UK' strategy earlier this year. and said although it will keep its London office, it will 'reduce its London footprint'. Alex Mahon, Channel 4’s chief executive said: “As a public service broadcaster with diversity in its DNA, Channel 4 has a unique ability to reflect our society. This is a significant and exciting moment of change for Channel 4 as we evolve to ensure we are best suited to serve all of the UK.